Matador combines the three elementary playingtypes movement, motor skills and the intense intellectual exploration of a real object. In contrast to unrealistic computer games, MATADOR building kits train the motor skills, three-dimensional imagination, concentration, creativity, understanding of technical contexts, as well as spatially analytical thinking. MATADOR Architect is a 100% natural product. It is made exclusively from untreated copper beech wood – without toxic varnish or other harmful materials. The building blocks were specifically developed for children 12 months and older. They can be connected and disassembled effortlessly. In this way, three-dimensional building becomes possible even for the youngest. This promotes motor skills, creativity and spatial perception. Discover Architect! The Maker wooden construction sets by Matador promote motor and cognitive development of our young children aged 3 years and older. Thanks to the own Matador hammer, building blocks and pins are connected so that children playfully develop craftsmanship skills.Using the special Matador pliers, the structures can always be taken apart and then re-assembled to form a new structure. Discover Maker! 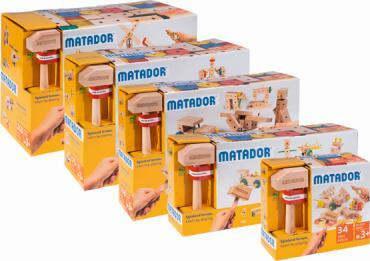 MATADOR Explorer wood construction sets are unique worldwide in allowing children to develop and implement their imagination and ideas. Thanks to the wood’s singular accuracy of fit, these sets fulfil the requirement for both simple and complex models. Blocks drilled to precision, perfectly fitting linking pins, axles and wheels – a variety of construction options which have fascinated young and old for generations. Discover Explorer! From the race track with ‘Cars’ on to the universe for a mission in ‘Space” or to the Middle Ages with ‘Catapults’ - no problem! 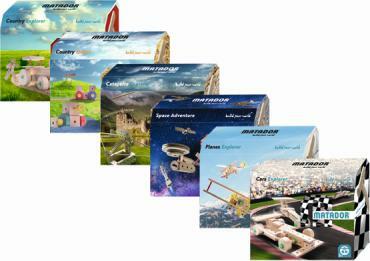 Six different theme worlds offer the age groups of 3+ and 5+ plenty of fun while building and playing! Discover World!